Celebrate with us Ambien Travel's 10th Anniversary! Join us on this very special European gay group cruise on board of Costa Magica to celebrate ten years of organizing the funniest (and most economic!) 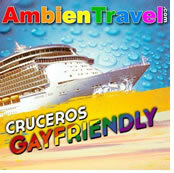 Ambien gay friendly cruises! 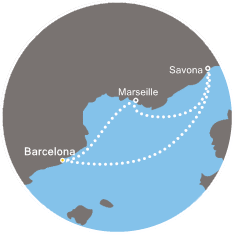 Four days and three nights sailing through the Mediterranean, in a trip packed with fun, laughter, friends... and LOTS OF SURPRISES! For example... CHURROS CON CHOCOLATE On board party! The biggest & funniest party of Barcelona (and Madrid!) will be with us celebrating Ambien anniversary. Are you going to miss it? 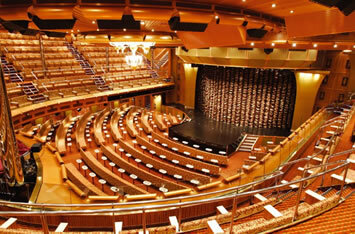 During this cruise we’ll host some private parties for our gay-friendly group. 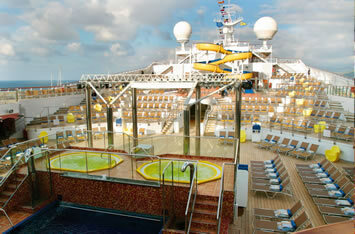 The entry to those parties are totally free for every cruiser on our group. You’ll enjoy the funniest music, some very special shows, live acts and lots of surprises. To celebrate Ambien Travel 10th Anniversary, we’ll have on board the funniest, biggest (& gayest!) party in Barcelona and Madrid: CHURROS CON CHOCOLATE. And we’ll also have the presence of BARCELONA’S MALE CHORUS, CMB! Of course, as traditional, we’ll enjoy an exquisite GALA NIGHT and our famous CARNIVAL PARTY! With prizes to te best costumes!! Don’t forget to pack everything! 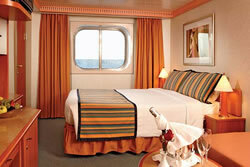 The Costa Magica is one of Costa Cruises fleet’s most luxurious ships. She has capacity for 3470 passengers and has a crew of 1027 people. She’s a fascinating ship, inspired by the beauty of the italian shores and her decks have the name of great italian artists. 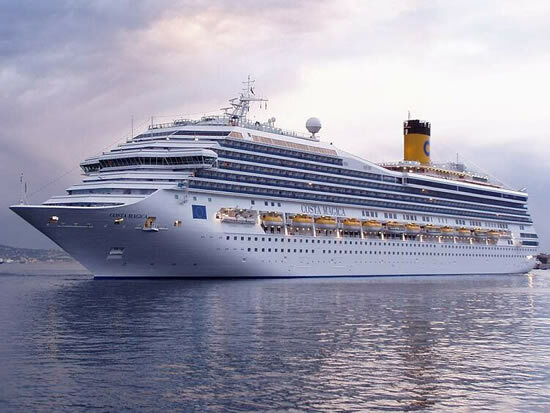 On board the Costa Magica you’ll find an Aperol Spritz Bar, a theatre show Broadway style, 100% italian pizzeria Pummid’oro, a disco, ice cream shops, pools, sports... There’s even a TV Cuisine Show: BRAVO CHEF! 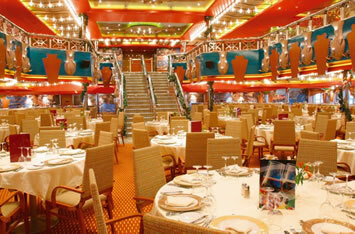 • A wonderful 4 days / 3 nights cruise through the Mediterranean. • Private Tours: One month before departure, we’ll send to all the members of our group a list of the private tours we’ll ofer on the ports we visit. Each tour has to be payed individually and they are not included on the final price. Drinks, like sodas, water at the restaurant, wines, cocktails, beers, premium coffees... are NOT included in the final price. For this reason we offer you the chance to buy an optional beverage package. If you do not wish to buy a package, you can always order and pay your drinks on every bar while on board. During every lunch & dinner you’ll be able to consume an unlimited quantity of glasses of a series of wines, beers and sodas. Who can say 'no' to a good glass of red wine, or a refreshing beer while having lunch? This is the ideal package if you’re only going to drink while eating, and it’s also the most economic. This pack includes the unlimited consumption of glasses of a series of drinks (with or without alcohol), that can be ordered at any time at the restaurant, the buffet (during lunch & dinner) and in the rest of bars on board the ship. This is the best formula for the lovers of cocktails, because this pack includes a selection of 34 cocktail types (with or without alcohol). A city you can’t help falling in love with: vibrant, cosmopolitan, proud, magnificent and generous, it will indulge you with exciting and vivid sensations. The night before the cruise, Wednesday, September 11th, 2019, we’ll celebrate Ambien 10th Anniversary with SPECIAL PARTY in Barcelona; and we’ll love to see you there. This can be an excellent point of rendezvous for the travelers of our Special Anniversary Cruise, and a good way to start to know each other. A strategic transit point for goods, but also a meeting place for cultures: you'll find vibrant evidence of these in the mosaic of its people. Marseille is one of the most visited cities in France. With many museums and galleries, along with ancient buildings of historical interest. Along the coast, cycling tracks veer around sunny coves and sandy beaches. France's oldest city is one of its most dynamic, with a melting pot culture and vibrant arts scene. The soul of the city is its Vieux Port, the working waterfront. 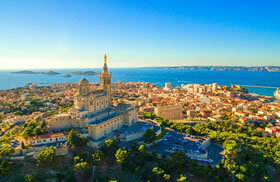 Marseille is also a gateway port to the scenic villages and coastal areas of Provence. Overlooked by the imposing fortress of Priamar, the port city will welcome you to the Riviera di Ponente, with its celebrated seaside resorts. Behind Savona's sprawling port facilities, the city's unexpectedly graceful medieval centre is well worth a stop. Among the old-town treasures to survive destruction by Genoese forces in the 16th century are the baroque Cattedrale di Nostra Signora Assunta and the lumbering Fortezza del Priamàr. There's also a nice urban buzz, with lots of new shops, bars and restaurants regenerating the old centre. 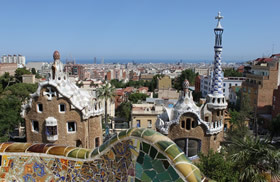 An important cultural and economic center in Spain, and indeed Europe, Barcelona is known as much for its unique architecture as its gay friendliness. 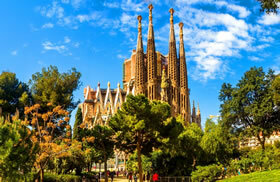 Since its founding, Barcelona has always been a center of art and design, culminating with Gaudi's masterpiece, the Sagrada Familia Basilica, a prime example of Art Nouveau architecture, with its bold color, beautiful tile work and swirling lines. 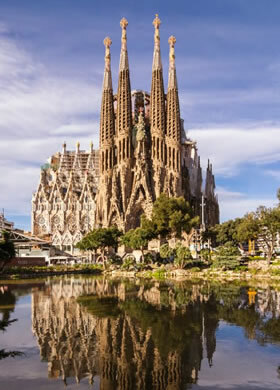 Spend a day wandering through the old Gothic quarter or take a 30-minute trip to Sitges, the famed gay Spanish beach resort. 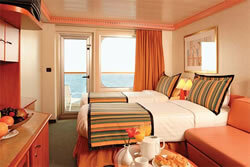 Taxes of €49pp, Gratuities of €30 pp (payable on board) and optional insurance are additional. 3% payment card charges are additional (no additional charges on bank transfer payments). First deposit of € 250 per person is required upon booking. Full payment is due 90 days prior to departure. Also included are the traditional Ambien Travel activities, subject to minimum participation.